The GMail blog team announced what looks like a much needed enhancement to Google Calendar this week called appointment slots. 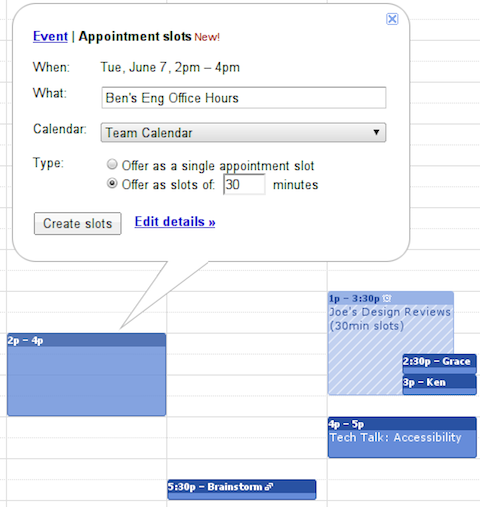 This functionality allows anyone to create a public showing calendar offering up times when appointments are available. The idea is that people can visit your calendar and schedule a haircut or consulting session any time day or night. Once the service is rolled out to all users you’ll see an extra link with the schedule box pops open that allows you to schedule blocks of time that are open for appointments. Choosing this function essentially creates another calendar and since every Google Calendar has its own personal appointments sign up page; you can embed it on your website or give the URL directly to friends and clients. You can find the URL for your appointment page at the top of the set-up page, which you can access via the Edit details link. Right now, one major limitation appears to be the both the owner of the calendar and those scheduling an appointment must use Google Calendar – not such a big deal for internal teams, but likely a deal killer for a hair salon. However, think about the implications of Google creating a “Click to Schedule” function for AdWords units, Places Pages, and Review Pages like those in HotPot. For many industries this could be a game changing kind of social action and another big revenue generator for Google. From a local business standpoint it gives Google another lever into the transaction while adding functionality for both buyer and seller.